Let’s face it, political campaigns are a hard slog; winning voters, losing voters, spinning facts and trying to please everyone. It’s a hard game to win. Luckily, we sporty types are better at convincing our audiences because we’re awesome and so is our product. With that in mind, Medau sets off on the campaign trail to get even more people exercising, moving and dancing on a regular basis without losing voters. Dance gets inactive people moving: that’s what research shows. Of the people who took part in the 2015 Participant Survey (conducted by EMD Insight and YouGov), 35% of respondents had previously been inactive before starting dance fitness classes. Of that percent, 55% of them hadn’t done any exercise for three or more years prior to starting classes; the inactive market is a good egg to crack. The key to cracking the egg is to find out what people want; I know, so ‘easy’. Well, we already know that people like to move and try things they haven’t done before; over the past year, Sport England’s This Girl Can campaign has resulted in 148,700 more women getting active at least once a week. That’s the equivalent of 407 people per day finding a new sporting habit! Although this growth cannot be solely attributed to dance fitness, we know it’s a great way for people to enter into regular exercise. The campaign is now in its second phase; participant led. This means it’s now down to the sports and clubs to inspire more women to get into fitness. This Girl Can did the leg work, now we have to carry it on! So, where does Medau fit into all this? Well, firstly, Medau is something that’s a little bit different. Difference is great in the fitness world; you need something to make you stand out from the crowd. With a rhythmic gymnastic background that’s adaptable to participant needs, the use of hand-held apparatus and a national team, Medau ticks all the boxes for being different. With that in mind, you’ll be pleased to know that Medau will soon feature on the This Girl Can website as an activity. This means fitness fans and those just starting out will stumble across Medau and, hopefully, sign up for a class. As you know, Medau’s demographic is widely 50 plus, and that’s no bad thing; fitness is important at any age and no-one is excluded from reaping the benefits of regular fitness. 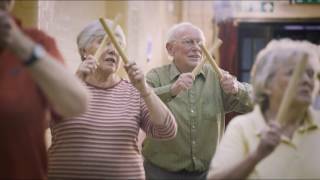 The new Public Health England campaign One You promotes exactly that, aiming to encourage and support middle-aged people on their health and fitness journey. There’s even a handy little quiz to get you started and who doesn’t love a quiz, right? The key thing is not to take the fun out of life; it’s just about making those small changes on a regular basis to get the fitness level higher and the cholesterol, blood sugar etc a little lower. What better way to do that then Medau? Think about it; you get to bounce balls, swing clubs, explore movement, laugh, and socialise with friends all at the same time whilst doing something great for your body! For any campaign to work, it needs its supporters to, well, support. This is where you lovely lot come in. Word of mouth is the best form of marketing; tell all your friends about your fabulous Medau classes and point them in the right direction of where to try one out. If you’re a Facebook or Twitter user, you can share posts from Medau and Exercise, Move, Dance to promote Medau and these campaigns; we know you know all about them, but it would be great for all your followers to know too! Medau is a fantastic form of exercise; we don’t need to tell you that. What we do need is a push so as many people as possible know about it. Are you ready to push? We certainly, absolutely, positively are. This is a guest blog from Sarah Leeves, Marketing Executive at the Exercise, Movement and Dance Partnership. Keep up to date with Medau goings-on by liking Medau on Facebook and Twitter. Follow Exercise Move Dance on Facebook and Twitter for news of national campaigns, local events and all things dance fitness!